REMEMBER: NERA-slot at AERA – NFPF/NERA, the main association for educational researchers in the Nordic countries. The deadline for applications for the NERA slot for symposium is on May 15, 2019! Applications must be submitted by the convener of the network and should be directed to President John Benedicto Krejsler (jok@edu.au.dk <mailto:jok@edu.au.dk> ). 1. Networks must send in a proposal for arranging a symposium at AERA by the latest of May 15th. 2. AERA’s application format for symposium should be used. A symposium consists of papers focusing on a common theme to demonstrate a range of perspectives or a variety of approaches. There should be participation from a minimum of 3 Nordic countries in the proposal. 3. The NERA board will draw lot among the applicants and announce the result before June 16th. 4. The selected network prepares the final application for the symposium and sends it to the president of NERA no later than September 1st. The normal AERA review procedure does not apply to this symposium because the quality assurance has been done by the networks. The network shall forward a short report on the AERA presentation to the NERA Board not later than one month after the AERA congress. 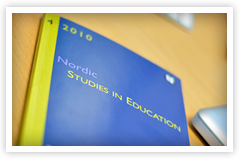 Nordic Studies in Education is a forum for scientific blind refereed articles within the whole field of educationa research. A pre-condition is that the author is working within the Nordic countries, or that the article focuses on an educational issue within that geographic area. In addition to ordinary articles, manuscripts may be worked out as essays, book reviews or short reports from conferences, congresses or similar arrangements.